Thinking you were a louse. At the party would be there. But would there be 9? But from RSVP – ing you’d refrained. In case your kid shows up. Will we see your kid’s face? And I didn’t want to be a turd. You couldn’t squeeze in a reply. So those left out are having a cry. Will your kid show up or not? As I lie down on my bed. While I curse you out of sight. Yes, yes, and yes! It takes no time at all to RSVP and it would be nice if people would take a smidgen out of their day to say whether they’ll be there or not. It stinks not having enough or having entirely too much. I know, right? Just make up your mind and let us know! Ha! As funny as ever. This just reminded me that I need to go and RSVP to a 5th birthday party…. I Love This…Sadly, So True. Thanks, and yes, sadly so true! It would have at least been polite to RSVP even if it is to say they won’t be attending! Did the child show up? My experience is that if you don’t hear from them, they aren’t coming. But you never know, right? What if they do come?? There will come a time when you are going to a party every weekend, it feels. So on the one hand I know that it just slips between the cracks for a few people. But, when you are planning the party you just need to know! Such a pain. I’m assuming you didn’t have their contact number or email. I truly hope they didn’t turn up. But that doesn’t help in the sleep department the night before when all you can think about is “what if they show up?” And btw – you have a talent for poetry … Loved it. Kelly L McKenzie recently posted…Naughty Elves or Lingering Ghouls? This happened more than once over the years. It was classmates that my kids wanted to come, but I didn’t necessarily know the parents well. Chalk it up to another parenting experience that fueled my creativity! Oh my gosh yes! We just had a part on Friday for my 9 year old and one of the parents never responded even after I emailed them with a time change, but the kids showed up…. Grrr. Good luck on your party! I will tell you that in my experience the non-RSVPs don’t come. But what if they do? Or did as in your case. Sigh. It is…hard! I totally feel for those people having shindigs at a restaurant. Big bucks and big stress about the non-RSVPers. LOL!!! You just killed the poetry game! Standing ovation to you! Hope you’re having a great week. Well, thank you! So glad you enjoyed my verse! I don’t know why is it so hard to just rsvp.. I hope THE MOM will see her ode.. I feel like such a louse now. 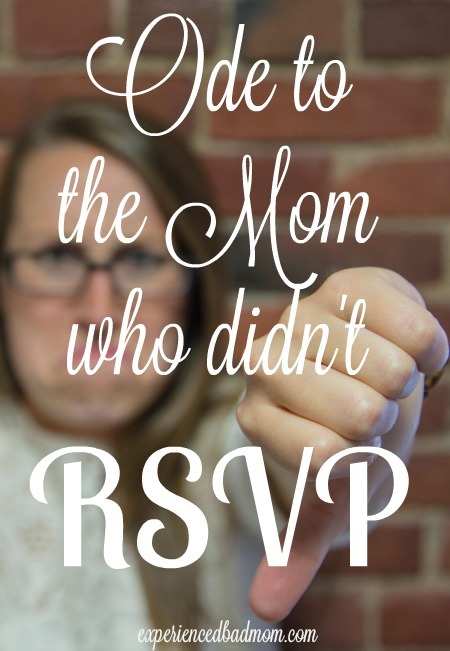 There have been too many times that I missed an RSVP deadline because I was trying to coordinate child care for my other kids, but never got it all worked out. Off now to RSVP for the latest birthday party invitation. Thanks for the reminder! It was nice of you to reserve a spot anyway. If I don’t hear an RSVP one way or the other, I just assume they’re not coming. And looks like they won’t have a goody bag! Very funny! We had one RSVP but then not show. Didn’t email or text to say something came up. Equally as rude. Novel point. 😉 More than one parent has failed to RSVP over the years. Plus, once I even did confirm they got the invitation and they still never let me know one or the other. Oh yes… It’s an ongoing issues for us all! I never understand why this has to happen. ARG!! *Did the GF Non-RSVPer show up? I gotta know!